To have balance in life certainly is one of the most important overall goals to reach. At the same time it is a real toughie. On the one hand you focus on something you want to achieve, you make progress, but on the run you lose focus in another area of life. Has this happened to you? It happened to me several times. May it be a strong focus in your career when you neglect your health or with a new relationship where you forget your friends or lose track of the drive in your career. But lasting fulfillment can only be reached in balance, otherwise the areas where we don’t focus on come back to us with unpleasant surprises. So how can we balance the important areas of our life and still achieve what we want? Answer: What is needed here is a wider perspective. First we need to take a step back and decide what the important areas in our life are. Second we have to make sure that we keep this perspective and don’t lose ourselves in only one area, turning our back to all the others. There are certain areas in our life that are important for every human being. These are mainly mind, body, spirit, social relationships, emotions, finances and belongings and career. Of course the degree of importance differs, but if we are able to have a certain focus in all areas we are able to achieve a healthy balance. That balance then in return will empower each area again, because there is no personal area that is dragging you down, while you climb up. Juice means all things Fun like Traveling, Celebrating etc. There may be other things for you, for instance Emotion or Contribution could be an own area of importance, or you want to divide Social into Family and other Relationships like Friends and Co-Workers. However, the whole point is not to create so many areas that you lose your wider perspective again. The concept at work here is chunking , that means to chunk all things into wider categories (areas of importance) so that we can keep control over them and don’t lose ourselves in confusion of endless things. Humans can comfortably work with 7 (plus-minus 2) things (see Wikipedia on Chunking). So don’t choose too much areas of importance and chunk them down into a larger piece. Also make sure that you create the right and meaningful areas to you. These areas are my personal areas of importance. The idea is to use these areas for everything you plan to do now. For instance I do a weekly planning where I write all things out I want to create over the following week. These tasks are categorized into my areas of importance on the professional and then on the personal level. They are aligned with my overall goals and emerge directly from them. They are the daily action-steps to fulfill the goals above. You can then lock these tasks into your daily calendar or write them on a 2do-list. The area of Profession is of course a special one, since depending on what you do as your chosen work, you may want to break this area down into several areas. Then there is your personal and your professional life. I did this, since my professional life is my company and areas here are: Product, Sales, E-Commerce, Technology, Marketing/PR and Leadership. By the way, this is a great model for business management and the philosophy of Constant and Never-Ending Improvement is working great on these professional areas of importance. Try this yourself by first setting your personal areas of importance and then setting at least one top-goal you want to achieve in each area. I suggest do view your goals in each area daily, but change the goals only monthly (if you have achieved them!) or if they are really no longer the right goals. Don’t make the mistake of changing your goals frequently. You can rate your areas on a scale of 1-10 and then review them once a month or every three month to set new goals. By rating them honestly you see how you made progress or where you must focus more. A 10 is of course the greatest happiness in that area of live you can imagine while a 0 is the worst situation possible. If you are able to move all areas of life above the 5 mark, I’m sure you will feel pretty good already. These areas of importance really don’t mean that there is no spontaneity in your life. You don’t need to walk around 24/7 and remembering them. Reviewing them once a week is enough. The key to positive change is not to do it overnight, but to do one small but consistent step after another in the right direction. What balance means to me is to make choices based on my core values and be true to myself. I’m a single mum and have experimented with my juggling and find when my son is away, I’m happy to compromise a bit of playtime to build me business. I admire women with loads of energy to start at 6am and finish at 11pm but that’s just not me. Great stuff. Been doing this and logging my activities. Where would you categorize travel? 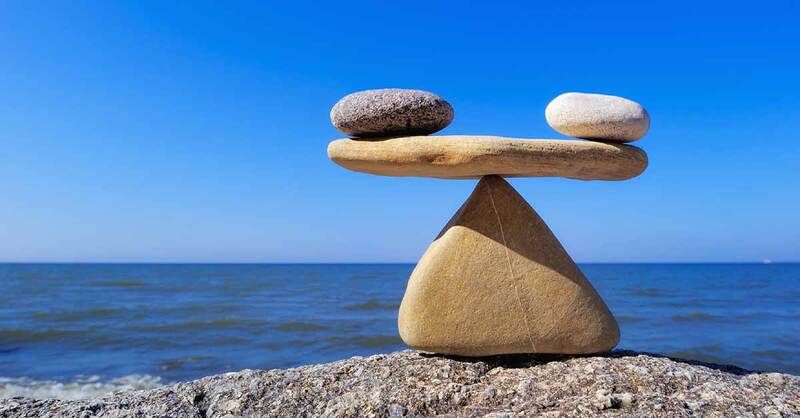 hello , Thank you for your informative blog , I believe that the mother of every problem in our life is imbalance factor at the same part .it means that we have to looking for an imbalanced point in any problem.the art of human is making balance for very thing.sorry if my English in not good. Abie, I would put creativity into 1. Mind. Very helpful and great article. I like the idea of chunking your goals into smaller tasks to achieve a great and balance life. Just wondering, where would you categorize nurturing your creativity? Having balance is the foundation of a meaningful life. If there are many things that interest you, pick a couple and focus on them for a while, fully savoring them. Sometimes I need to reel myself in from wanting to try too many things until I realize that there just isn’t enough time. I’ve found a few things that I can really focus on these days that bring me joy, so that is what I spend my time on. Enjoyed your post. Hey! Can someone just give me some extra explanation. So when I decide to start and write down my goals it’s best to first just start brain storming in each of the 7 categories? Then decide which is more important and then also perhaps set a time frame for those goals? Did I get this right? Sorry, it’s just so much information which makes me confused hah. Great Post :-) also i feel we are so lucky that we live this moment who know what will be next minute show us in our life so take risks; take time to laugh, cry, and do something crazy which will give you happiness. Thanks for the good stuff. Creating goals puts only pressure on yourself, be happy with what you have and take care of your loved ones and friends, are you feeling much better. Hej! I really like this post! In my opinion you should add vocation to These areas. Thats whats important to you. Have a good Day n’ Move forward. I recently used some of your information on a report for my teacher! Thanks for the good stuff! But how can we make room for all of these things, if we have so little time to live anyways? I personally use a journal and write down a goal there for each area. The time period is usually 3 month and the number one goal is the most important one for me for the time. In that way you keep automatic focus in each important area of your life, because you take your most desired think for each and move forward to achieve this goal. You can check yourself within the journal every time, which helps to keep the focus. Balance, we all need it. For years I taught the importance of balance in sports. Only recently I realized the importance in every aspect of life. I am on a journey to change myself from an underachiever to a self actualized man. I use my blog to track my progress. You can also find a post about balance in sports and life there.